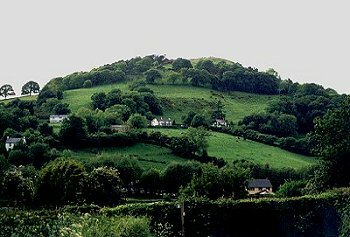 Isolated and partly wooded hill rising steeply from the nucleated settlement around the medieval church to the Iron Age hillfort above, with scattered houses, and surviving industrial remains. The area forms part of the medieval ecclesiastical parish of Bodfari. Administratively, it formed part of the commote of Rhuddlan in the ancient cantref of Tegeingl. The final element of the name Bodfari suggested to a number of early antiquaries that it was to be identified as the site of the Roman Varis, but this is now felt that the this was in the vicinity of St Asaph (Blockley 1991, 117). A number of chance finds of possibly Bronze Age and Roman date in and around the village suggests early human activity in the area. The earliest certain evidence of human settlement is represented by the hillfort on the summit of the hill at Moel y Gaer, to the north-west of Bodfari. It is one of the smallest and lower-lying of the chain of hillforts along the Clwydians, having a single entrance to the north and largely depending on the steep natural slope on the eastern side for defence. The hillfort is probably of Iron Age date, but there is no certain evidence of when it was built, whether it was permanently occupied or when it was abandoned. Being fairly readily accessible from the valley below it was noted by various early antiquaries such as Edward Lhuyd and Thomas Pennant, from the 17th century onwards. A church at Bodfari may be referred to under the name of Boteuuarul in the Doomsday Book of 1086, and Batavari mentioned in 1093, but was certainly in existence by the middle of the 13th century. The site of a possibly early medieval holy well, named after St Deifer, an early patron saint of the church, now lying in an area of wasteland to the south-west of the church. The village consisted of perhaps no more than about four buildings near the church in the 18th century, and had only slightly expanded by the time of the tithe survey in 1845. During the course of the 18th and 19th centuries the settlement expanded along the turnpike road to the east of the medieval church, the Coed-y-llan quarry, several limekilns and a Methodist chapel and school becoming established here, together with a number of cottages on the steep eastern slopes of Moel y Gaer. A haematite mine was also being worked to the north of the village between 1877-1909, visible remains being represented by a number of converted buildings including the former agent's house and workshop, together with mine shaft and possible horse whim now obscured in woodland. Bodfari was served by a station on the Mold & Denbigh Junction Railway, in operation between 1869-1968, and though quarrying and mining had ceased early in the 20th-century, industrial activity continued with the the Partington Steel & Iron Company with railway sidings built in 1924, the remains of which are still visible (Baughan 1991, 76-9). 20th-century housing estate. Partially detached upland area forming part of the Clwydian hills to the north of the Aberchwiler valley, ranging in height from 50m OD to the summit of Moel y G aer, at a height of 206m OD. Part of the area falls within the Clwydian Range AONB. Building materials in the village include quarried limestone in the case of the medieval church tower (the remainder of the church having been rebuilt during the 19th-century), the partly rendered 17th-century brick inn next to the church, and ?18th-century brick barn. Traces of late medieval box-frame building at Pistyll, now infilled with brick, 19th-century brick farmhouse, and late 19th-century stone mine agent's house and workshop, all to the north of Bodfari. 19th-century red brick school with stone dressings. Buildings in the hills are fairly widely spaced, including low slatey converted farmhouse at Adwy-wynt with stone outbuildings and stone-walled yard, and a number of modern and converted, rendered cottages. Much of the steeper eastern hill slopes are covered in deciduous woodland such as Coed-y-llan immediately above Bodfari, of oak, ash, holly, sycamore and birch, classed as ancient semi-natural woodland. Irregularly-shaped semi-improved pasture cut out piecemeal fashion from the woodland on the more gently sloping ground with multi-species hedges including hawthorn, ash and holly. Some grown out hedges represented by intermittent trees or shrubs, and some lynchets and field banks of abandoned field boundaries. Coed Moel-y-Gaer, to the south of the hillfort includes coniferous planting whilst the Warren includes some ornamental planting around the large 19th-century Warren House. Abandoned roadside milk churn stands. Steep winding lanes up the eastern and western sides of the hill, some unsuitable for motorised vehicles, often running in hollow-ways, some revetted with shaley drystone walling. Small area of former parkland character around Grove Hall.